Jihadist groups around the globe denounced Saudi Arabia’s execution of more than 40 men in early January. Some of those sentenced to death had taken part in al Qaeda’s first campaign to disrupt the kingdom between 2003 and 2006. It was only natural, therefore, that al Qaeda, its regional branches and other affiliated groups would decry the House of Saud’s decision to follow through on the death sentences. However, Ansar al Sharia Libya’s response was especially noteworthy. In a three-page statement released via Twitter on Jan. 15, the group compared those executed to senior al Qaeda leaders killed in America’s drone campaign. 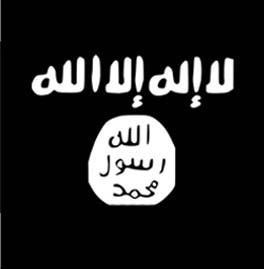 “Al Salul [a derogatory reference to the Saudis] recognizes the importance of the true righteous scholars who control jihad with the correct provisions from the book of Allah Almighty and the sunna of His messenger, peace and blessing be upon him, and the impact of the absence of these scholars on the jihadist arena,” Ansar al Sharia Libya’s officials wrote, according to a translation obtained by The Long War Journal. Ansar al Sharia then listed eight such “scholars,” all of whom were al Qaeda leaders killed in US airstrikes: Harith bin Ghazi al Nadhari, Ibrahim Rubaish, Anwar al Awlaki, Nasir al Wuhayshi, Abu Musab al Zarqawi, Abu Yahya al Libi, Atiyah Abd al Rahman (referred to as “Atiyatallah”), and Khalid al Husainan. The list is no accident. Ansar al Sharia regularly promotes sermons delivered by some of these same ideologues. Web banners used to advertise the speeches, which were first produced by al Qaeda, can be seen at the end of this article. Throughout December and January, the organization’s radio station, Ather al Madinah, posted clips on social media of lectures by Nadhari and Rubaish, two al Qaeda in the Arabian Peninsula (AQAP) clerics who were killed in 2015. Several lectures by Rubaish, a former Guantanamo detainee who became an influential AQAP theologian after he was released from US custody, covered similar themes. In one, Rubaish advised Muslims to avoid selling out their religion for the pleasures of this world. Still another featured Rubaish and Nadhari together. Abu Yahya al Libi’s speeches have also been rebroadcast by Ather al Madinah. Al Libi blasted the supposed false “idol” of democracy in a talk disseminated online in December. Al Libi was one of al Qaeda’s most prominent ideologues at the time of his death in June 2012. 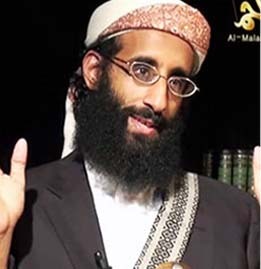 On Sept. 10 2012, al Qaeda chief Ayman al Zawahiri confirmed al Libi’s death in a video released online. Zawahiri also called on Libyans to avenge his fallen comrade. Ansar al Sharia Libya and other al Qaeda groups attacked an American diplomatic mission and the CIA’s so-called Annex the following day. Abu Khattala is the lone suspect from the Sept. 11, 2012 Benghazi raids in American custody. 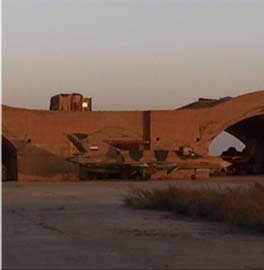 A screen shot of the fighters who chanted in the video can be seen on the right. The video was shot at a training camp named after Mohammed al Zahawi, Ansar al Sharia’s first emir (or leader), who died as a result of injuries in either late 2014 or early 2015. After Zahawi’s death was confirmed in January 2015, Nadhari released a eulogy for the slain jihadist. Nadhari explained that Zahawi had personally met with Osama bin Laden in the 1990s in Sudan and adopted al Qaeda’s methodology at that time. Although Ansar al Sharia Libya was initially portrayed by some as purely a local jihadist group, it has been a part of the al Qaeda network since its inception in 2011. 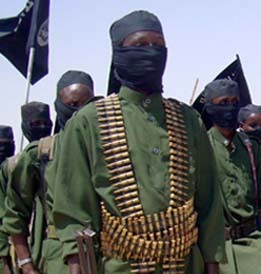 The Long War Journal has documented the organization’s ties to al Qaeda and its branch in North Africa, Al Qaeda in the Islamic Maghreb (AQIM), on multiple occasions. And the group now openly promotes al Qaeda clerics to its followers on a regular basis. One must look at the parallel history of al Qaeda and the franchisees they supported versus IIL/Daesh. Appended to that analysis must be a reckoning of the secular organizing states: Saudi Arabia and Turkey. Riyadh delivered through their oil riches a fully formed set of terrorist organizations. In addition to the franchisees (al Qaeda seemed to be trhe McDonald’s of the terrorist biz, providing financing, training, plan vetting, branding, etc. to local leaders. Riyadh as well planted the seeds of future action with the decades long construction of mosques throughout Africa and other areas. Selected radical Imams were sent to manage he mosques and recruited dissatisfied natives. Piracy along the east and west coasts of Africa occurred. al Qaeda laundered the money and split the boodle. To Riyadh, it was already the Caliphate. Flash forward. Our Surge, in addition to smothering al Qaeda in Iraq drove Saddam’s army north and west. 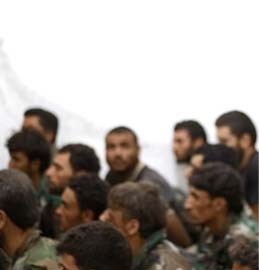 Some speculation suggested that these Sunni joined Assad’s Alawite/Shi’ite army. Not bloody likely. The center of power in Turkey was the military == Generals who cause hearkened back to the days before 1918 when the Ottoman Empire owned the Middle East and occupied the Arabian Peninsula, controlling the Holy Cities of Islam — from Mecca to Jerusalem. The Iraqi troop was welcome north of the Syrian border. Turkey had and has a Kurdish problem in the southeast quadrant of Anatolia — home to a majority Kurdish populations. Saddam had a similar problem in Iraq before America intervened. What better use of his Army could there be than, working for the Central government in Ankara. The accession of Erdogan squared the circle. ISIL was formed. out of the Iraqi exiles and others. Ankara granted the force support and cooperation as moved south and established a full fledged Caliphate. 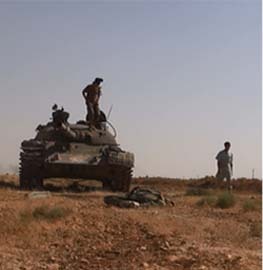 Territory was hacked out of northern Syria and Iraq. Now see the recruiting of al Qaeda franchisees. Many have demonstrated their terrorist capabilities.